May Construction has served central Florida since 1980 specializing in building screen rooms, pool enclosures, carports and patio covers, rescreening rooms and pool enclosures and installing vinyl windows on single family homes. We are also experts in adding vinyl siding, roofovers, garages, carports, utility sheds and screen rooms to manufactured homes. We strive to give our customers the very best service of any company in Central Florida. Our main goal is to make you happy with the service you choose from us. We offer competitive pricing and 100% customer satisfaction. Please call us today for a free estimate. We are here to serve you and hope you will join our thousands of satisfied customers. Serving: Apopka, Belle Isle, Celebration, Clermont, Conway, Davenport, Daytona, Edgewater, Kissimmee, Maitland, Mims, Ocoee, Orlando, Oviedo, Titusville, Windemere, Winter Garden, Winter Park, and Winter Springs. We accept major credit cards or personal checks. Licensed and insured – All work guaranteed! 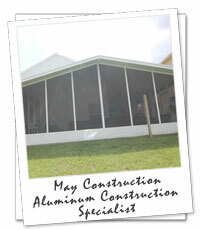 May Construction is a Member of the BBB. Click BBB logo for more information.